Echinacea 'Shortcake' is a new 2010 introduction from Arie Blom that is what we like to call an "aging color' coneflower. Meaning that as the flower ages it takes on new color. 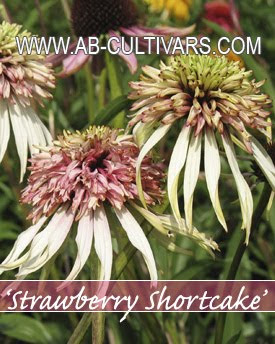 This double coneflower starts cream white but as they age they take on a dark rose color. The ray petals stay that cream white color. A bonus is the strong stems and long lasting, making it a great cut flower. Certainly different than others on the market and a must add.